Maryam Rajavi, the President-elect of the Iranian opposition, arrives at the main conference hall in Tirana, Albania. 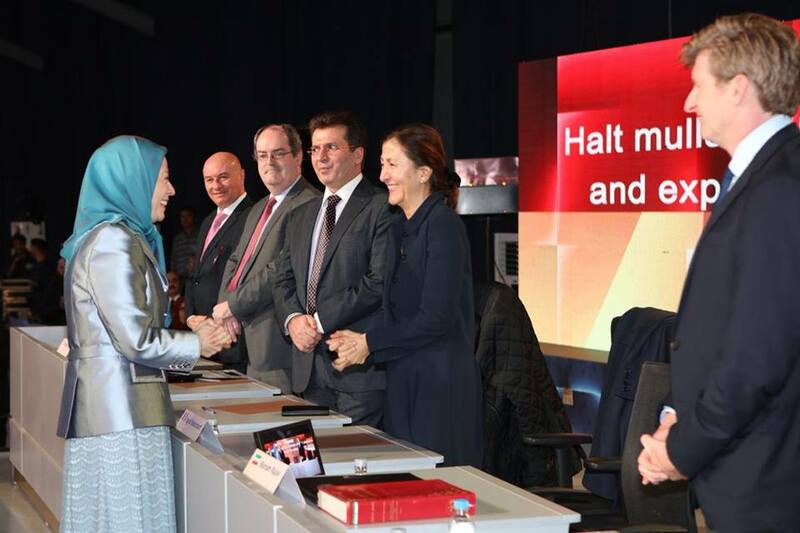 Rajavi greets distinguished speakers of the conference before joining them on the panel. On Saturday, December 15th, the Iranian Communities, supporters of the MEK, held a joint video conference in 42 cities across Europe, North America, and Australia. The purpose of the conference was to discuss the ongoing popular protests in Iran and the regime’s terrorist actions against the MEK and the Iranian opposition. Rajavi then urged the international community to end the policy of appeasement toward the Iranian regime. “If you don’t want to stand by the people of Iran, at least do not victimize your own citizens’ security. Why do you aid a regime that poses threats to European capitals? This is our word: Respect the Iranian people’s desire to overthrow the regime and establish freedom and democracy. Let the hands of this criminal regime be cut off from Iran’s oil revenues which is our national asset. Every barrel of oil the regime sells is a lash on the back of the people of Iran and a bullet piercing the heart of the people of the region. The regime’s successive missile tests aim at nothing but blackmailing and threatening regional and global peace,”.
.@PJK4brainhealth: Former member of US House of Representatives. 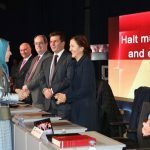 Representatives from over 300 Iranian associations across the world also spoke at the conference in order to reaffirm their support for the NCRI, the MEK, and Maryam Rajavi’s Ten-point Plan for re-establishing democracy in Iran after the fall of the mullahs’ regime. Speakers and participants at the conference included President-elect of the National Council of Resistance of Iran (NCRI) Mrs. Maryam Rajavi; former member of the U.S. House of Representatives Patrick Kennedy; Minister of State for Diaspora and former Prime Minister of Albania Pandeli Majko; Republican Party Leader and former Albanian Defense Minister Fatmir Mediu; former Algerian Prime Minister Syed Ahmad Ghozali,; former Colombian Presidential candidate Ingrid Betancourt; Deputy Leader of the U.K. Liberal Democratic Party Lord Navnit Dholakia; French Governor and former Director of DST Yves Bonnet; Chair of the Committee on Equality of Men and Women in the Parliament of Romania Christina Luristina; Deputy Chair of the Financial Committee in the Senate of South Ireland Gerry Horkan; Member of Italian Parliament Antonio Tasso; and Member of the Norwegian Parliamentary Judiciary Committee Peter Eide. A number of other politicians, legal, and religious figures also attended the conference, as well as members of the Iranian communities. The conference was held in 42 cities including Ashraf 3, the MEK camp in Albania; Brussels, Belgium; Ottawa, Toronto, Montreal, Vancouver, and Winnipeg, Canada; Copenhagen and Arhus, Denmark; London, Liverpool, Bristol, Sheffield and Birmingham, U.K.; Helsinki and Turku, Finland; Paris, France, Berlin, Cologne, Stuttgart, and Frankfurt, Germany; Rome, Italy; Luxembourg, Luxembourg; The Hague, Zwolle, and Eindhoven, The Netherlands; Oslo and Kristiansand, Norway; Bucharest, Romania, Zurich, Switzerland; Stockholm, Gothenburg, Malmo, Boras, and Solleftea, Sweden; Washington, D.C., Berkeley, Orange County, Atlanta, and Dallas, U.S.; Vienna, Austria; and Sydney, Australia.